The School of Mechanical Engineering was founded in 1882, the first of Purdue's schools of engineering. In its infancy Mechanical Engineering shared space in University Hall, the Mechanics Building, and the Engine and Gas House, power plant number one. The Engineering Laboratory, dedicated on January 19, 1894, was the first Mechanical Engineering Building. Four days after the dedication there was an explosion in the boiler room and the building, except for the wood shop and foundry in the west wing, burned to the ground. President Smart in the University Chapel the next morning vowed to rebuild the building "one brick higher". In December of 1895 the new building was dedicated as the "Mechanical Engineering Building" and became known as Heavilon Hall. It was reported to be nine bricks higher than the original Engineering Laboratory. The clock and chimes for the new tower were installed on April 8, 1896, and were purchased by gifts from the Ladies' Matinee Musical of Lafayette and from the class of 1895. The clock mechanism was manufactured by the E. Howard Watch and Clock Company. The chimes were Blake bells. The chimes struck every fifteen minutes and played a tune just before striking on the hour. The clock had four faces, each about 7 feet in diameter. Heavilon Hall was demolished in 1956 and the clock and the bells were put in storage. In 1995 the bells found a new home in the new Purdue Bell Tower. Professor Jack Fessler, School of Veterinary Medicine, restored the clock mechanism in the early 1990's. It is now operating and on display in the atrium of the Gatewood wing of the ME building. The present Heavilon Hall occupies the site of the former building. The response to the tragedy of the fire was so great that, in the one-brick-higher tradition, a new Locomotive Testing Plant was built at the same time directly north of the new Mechanical Engineering Building to house the Schenectady Locomotive that had been damaged in the Heavilon Hall fire. The Locomotive Testing Plant was demolished in the mid 1960's. The formative years marked a series of firsts for the School of Mechanical Engineering. In June 1885, Charles Ratliff of Spiceland, Indiana, became the first Purdue Graduate to receive a bachelor’s degree in engineering. The first post-bachelor professional degrees were granted in 1891. The first MSME degrees were awarded in 1922. Maurice Zucrow was the recipient of the first PhD degree granted by Purdue in 1928. In 1926 the American Railway Association built and equipped a building near the current present Mechanical Engineering Building for the School of Mechanical Engineering to conduct research on railway draft gears. The building was constructed for about $25,000 and contained a $40,000 vertical testing machine. The machine was made by the Tinius Olsen Company of Philadelphia and was the largest of its type in existence in 1926. After a testing period of approximately two years the building and equipment became the official property of Purdue University. The building is still in use today as an office facility. Another building associated with railway research in the School of Mechanical Engineering was the Locomotive Museum. The building was conceived by Dean Goss in 1900 to properly preserve some of the more valuable steam locomotives and the research advances in the industry by the School of Mechanical Engineering. When the building was razed in 1930 to make room for the current Mechanical Engineering Building, many of the items on loan to the museum were returned to their owners. Many pieces of the outstanding collection are now housed at the National Museum of Transport in Kirkwood, Missouri. In April 1930, the Purdue Board of Trustees officially christened the first Mechanical Engineering Building as Heavilon Hall. The laboratory wing of the present Mechanical Engineering Building had opened and was now called the "Mechanical Engineering Building". The main wing of the current building was dedicated in 1932. The south end of the current building east wing was completed in 1942 and was called the "Aeronautics Lab". The connection between the Aeronautics Lab and the main building wing was completed in 1948, thus completing what is the current Mechanical Engineering Building. The original southeast wing was renovated in 1975 at a cost of $1,476,000. The main wing and southeast wing were renovated in 1980 at a cost of $2,504,600. The original construction costs of the building were as follows: 1929, $161,837; 1932, $192,920; 1942, $75,884; 1948, $97,512. The planning for an addition to the current Mechanical Engineering Building actually began in 1955 when Scholar Architects prepared a preliminary plan for an addition on the west end of the building. Due to a lack of funding those plans never materialized. In the summer of 1999, President Beering approved the Schools of Engineering's master space plan which included a new addition to the ME Building. In the summer of 2000 the School of Mechanical Engineering formed a committee to start the planning and fund raising for an addition to the building. The academic plan for the addition was completed in April of 2001 and calls for a 55,300 ASF addition to the west end of building. The architectural program of the space in the addition was completed in the fall of 2003. The plan called for the addition to house an atrium (4,000 sq. ft.), five new classrooms (8,880 sq. ft.), eight new research laboratories (19,204 sq. ft.), four instructional laboratory facilities (12,986 sq. ft.) and offices/support facilities for faculty, staff, and students (10,230 sq. ft.). Completed in May of 2011, the innovative Roger B. Gatewood Wing addition adds 41,000 assignable square feet to the Mechanical Engineering Building including flexible classroom space, student commons, computer labs, student learning labs, and many other spaces that will make Purdue's Mechanical Engineering program a leading institute in its field. The $34.5 million state-of-the-art addition is the very first Purdue building constructed to LEED certification standards. The Leadership in Energy & Environment Design (LEED) standard is set by the U.S. Green Building Council to verify that a building, like the new Gatewood Wing, was designed and built to increase energy savings, improve water efficiency, reduce CO2 emissions, improve indoor environment quality and be thoughtful of the stewardship of resources and their impact of use. The new addition symbolically blends the role of ME in the “old” and “new” economies. The clock from the first Mechanical Engineering Building was removed from static display in the ME building and is designed into the atrium as a working model with all of its components clearly visible. Of course, the original clock bells remain in the Bell Tower just a few feet away. Much smaller symbolic bells are being used in their place. The American Railway Association Building has been returned to ME. The plan is to design the Railway Building into the new addition in such a way to symbolize its importance in the history of the School. Until 1909, the areas of study and research within the School of Mechanical Engineering were considered sufficiently general to require no differentiation in terms of curriculum offerings. The School of Mechanical Engineering was the first to offer concentration on specific areas of engineering knowledge. The first four areas established were Railway Engineering, Steam Engineering, Gas Engineering, and Heating and Ventilation. In actuality, steam engineering was the precursor of them all, predating and paving the way for railway engineering and all other areas—leading to the many areas of expertise available to Mechanical Engineering students today. Two satellite research laboratories of the School of Mechanical Engineering came into existence during the middle formative years of the School. In 1946, Dr. Maurice Zucrow returned to the campus to organize and develop the first university propulsion center in the United States. The Thermal Sciences and Propulsion Center came into being in 1947; today it is known as the Maurice J. Zucrow Laboratories. In 1957, with a financial gift from Ray W. Herrick (president of Tecumseh Products Corporation), Professor William Fontaine founded the Ray W. Herrick Laboratories, conducting research in refrigeration and high-performance buildings. Purdue ME faculty and students conduct research in 19 different buildings across the campus, including the Maha Fluid Power Research Center, and the Birck Nanotechnology Center. 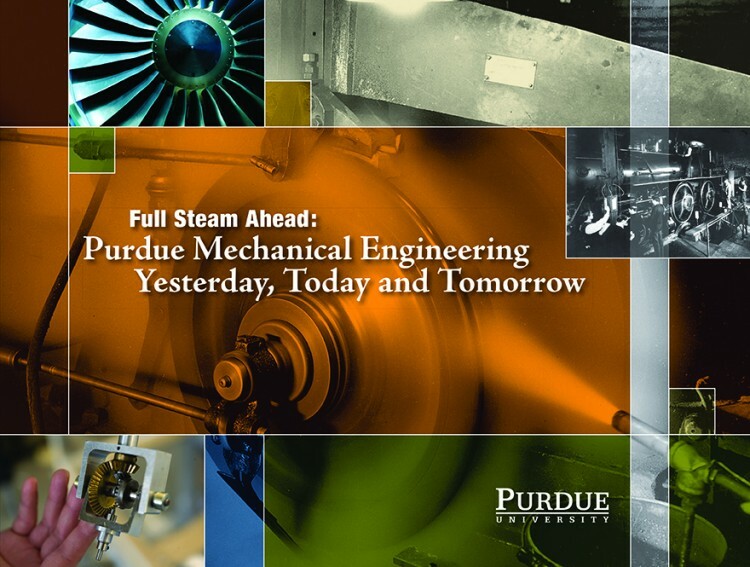 Read more about the history of Purdue ME with the book Full Steam Ahead: Purdue Mechanical Engineering Yesterday, Today and Tomorrow, written by John Norberg, available in hardback or e-book on Amazon or Purdue University Press. Read more about the historical photos hanging in the ME Building.